In January 2001, natural gas exploded in the central Kansas town of Hutchinson, killing two people, destroying two downtown businesses, and creating a series of geyser-like spouts of water and gas. For weeks, Hutchinson residents wondered what had happened and worried about what was coming next. Today, some of the most heavily examined geology in Kansas lies beneath western Hutchinson, along the probable path that the gas took into town. The Kansas Geological Survey used a variety of techniques to study the area. While the gas’s movement isn’t completely understood, Survey geologists know a great deal. Here’s the Survey’s working hypothesis. The source of the natural gas, or methane, appears to be a storage facility west of Hutchinson (near a railroad-siding town named Yaggy). In the 1980’s, salt caverns were created for storing propane in a layer of rock called the Hutchinson Salt Member of the Wellington Formation, about 500 to 600 feet below ground. These same salt beds are mined in Hutchinson and throughout central Kansas. Salt caverns are effective for gas storage because gas can be quickly introduced, and later removed. That’s especially useful during times of peak demand, like cold winters. At Yaggy, the salt didn’t fail. But a pipe (one used to put gas in and take gas out) did fail. For at least three days, highly pressurized methane escaped through a hole in the pipe and moved up until it reached a permeable zone near the contact between the Wellington Formation and the overlying Ninnescah Shale. These rocks dip (or are angled) very slightly to the west, and the pressurized gas moved up that dip until it found a way to the surface. In Hutchinson, a town with a century’s history of salt mining, that didn’t take long. Gas first exploded after it moved up an old well that was used to produce mineralized water for a spa. The second explosion occurred at the site of an abandoned well that was used to dissolve and mine salt. Once the Yaggy leak was discovered, the cavern was emptied, cutting off the source of the gas. That left methane under Hutchinson, though nobody knew how much or where it was. The local utility, Kansas Gas Service, drilled wells to try to locate the gas and flare it off. The first two, drilled where gas was expected, came up empty. A few additional wells, put down mostly where the company could gain quick access, found small amounts of gas, though most of these vent wells were dry. Twelve days after the first explosion, the Survey’s shallow seismic reflection crew arrived in Hutchinson. The Survey’s crew specializes in very shallow (less than 1,000 feet deep) applications of seismic reflection. Gas Service wells were finding gas at depths between 420 and 250 feet. Cross section of Reno County geology, showing the hypothetical movement of gas from a salt cavern to eastern Hutchinson. The seismic crew ran a four-mile-long line between Hutchinson and Yaggy, trying to create an image of the gas’s pathway. A second, much shorter line was run near a venting well in a city park. Survey scientists collected 60 gigabytes of data, enough to fill about 100 compact disks. After round-the-clock computer processing and interpretation, the Survey recommended that Kansas Gas Service drill two wells along one seismic line. Both hit gas. The Survey’s efforts involved more than seismic reflection, however. • Geologists studied the area’s subsurface, looking for clues to the source of the gas and possible conduits from Yaggy to Hutchinson. They looked at records of oil and gas wells drilled in the area, core samples of rock from wells that had been drilled near Yaggy and near the town of Lyons, about 30 miles away. They also examined core that Kansas Gas Service recovered from one of the vent wells drilled along the seismic line. • Geologic engineers analyzed pressure records from the vent wells to estimate the amount of gas remaining under the city and how long it would take to vent that gas. • Working with the state’s Data Access and Support Center, the Survey created a web site with information about the situation (http://www.kgs.ku.edu/Hydro/Hutch/	index.html). • Geophysicists applied electromagnetic methods to help pinpoint the metal casing of long-forgotten wells that might provide a way for the gas to move to the surface. • The Survey coordinated two NASA flights over Hutchinson and Reno County aimed at detecting low levels of methane to see if gas was continuing to escape. After all this, Survey scientists theorize that the escaping gas may have pushed along fractures in rocks above the salt, then flowed through a thin bed of a limestone-like rock called dolomite. Layers of gypsum, lying above the fractures, may have trapped the gas underground—like bubbles of air under the ice on a pond—except in the places, such as old wells, where gas found its way to the surface. That remains a theory. The Survey’s study of Hutchinson remains a work in progress. But one thing is clear: Years of developing geologic techniques and expertise, and decades worth of data and core samples, all became invaluable in an instant. And that same information may help prevent something similar from happening again. 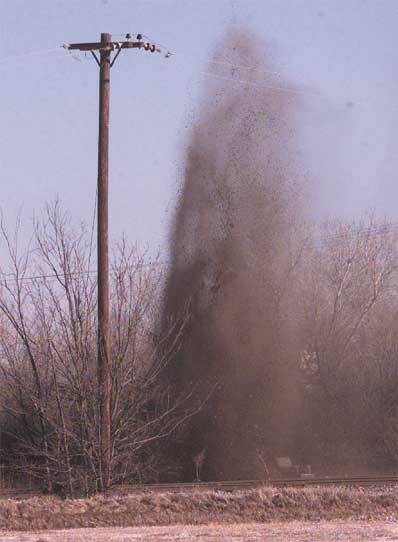 The largest of several gas and brine geysers spews dirt, water, and gas more than 30 feet in the air northwest of the Big Chief Mobile Home Park in Hutchinson, where a mobile home exploded January 18, 2001, killing two people. Photo by Sandra J. Milburn. Printed with permission of The Hutchinson News.